It’s not that every Fashion Friday will be devoted to Stitch Fix*, it’s just that I’m still trying to review all the Stitch Fixes I’ve received so far. I ordered three boxes in spring/summer, and reviewed the first one here and the second one here. I ordered another Stitch Fix not long after the second one. With my first two boxes, I ended up with a couple of fantastic dresses; what I really needed next for summer was a couple of cute tops for work. I specifically asked for that when I ordered this box, and I stipulated that I needed them to not be sleeveless. Of the five items they sent, two of them were tops and only one would have been somewhat appropriate for work. And they sent me two more dresses, both sleeveless. Blast! 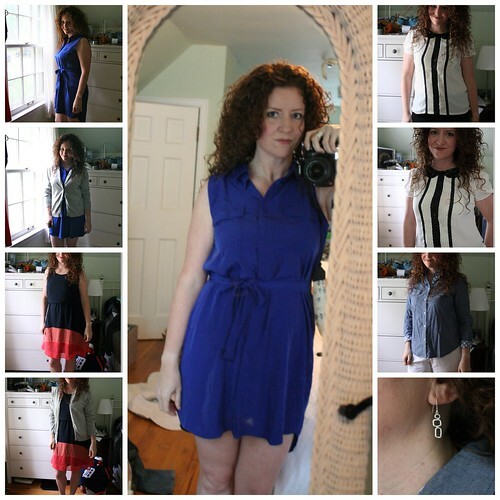 #1 – blue dress (left #1 and #2,, and middle picture) – yet another sleeveless dress! I totally didn’t need another dress. But the truth is I fell way in love with this color, which is not like anything else I own. It was a button-down shirt dress, made out of a slippery material. And it was pretty short. Shorter than what I ordinarily wear to work (though you can see in the upper left corner pic that it’s longer in the back, which is kind of cute). 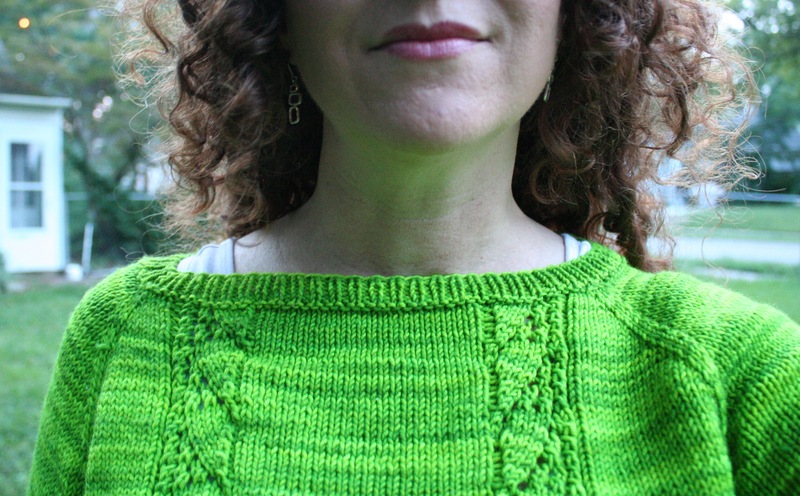 And of course for work, I’d need to pair it with a cardi (as in pic #2), which I’m not wild about in summer. Verdict: Sent back. Love the color, but nothing else about it works for me. Will look for something in that color for my wardrobe. #2 – color block dress (left #3 and #4) – It’s hard to tell in these shots, but this was a dark navy (not black). Yet! Another! Sleeveless! Dress! Longer than the blue one. A nice, light material. The top is blousy, which was nice in that it was not too clingy, but maybe also not very flattering. I wasn’t sure what I thought of it with a cardi. Verdict: Sent back. Cute concept, but not particularly flattering. I also don’t need another sleeveless dress, obvs. #4 – chambray shirt with polka dot details (right #3). This was pretty cute. It was lightweight, comfy, and the sleeves could be rolled up in a variety of ways, with a tab to hold them in place. The polka dots showed on the cuffs as well as on the button band. But I wouldn’t really consider this a blouse for work, and I don’t really need casual tops right now. It was also $58 – not too pricey for a good dress shirt, but too much for this particular top. Verdict: Sent back. I didn’t need it and I didn’t love it. #5 – earrings – Sterling silver, very cute, and I’d been wanting a new pair of silver earrings. I wasn’t sure whether to keep these or not. They were $48, which I consider a lot for small, non-jeweled, non-handmade earrings. But I’d be out the $20 whether I kept them or not – that’s the styling fee. So after that, it was just another $28, and the question was did I love them $28 worth. Verdict: Yes, I love them $28 worth – total keeper. And I’m so glad I did! I’ve actually gotten so much wear out of these – they’ve become my go-to earrings in place of my standard silver hoops. And I’ve gotten a lot of compliments on them. If you look closely, you can even see them in yesterday’s sweater post. They aren’t as noticeable as some of my huge dangly earrings, but they show up well enough, even with all my hair. I also wanted to show you the purple top from my first box again. It was in a couple of smaller pictures in a collage in my first review, and those pics didn’t really do it justice. I’ve worn this top several times, in several ways, over the last three months, and I always feel good in it. I wore it to church this past Sunday and got so many compliments. I paired it with a white skirt from White House Black Market, an old silver loop chain belt, and some light grey pumps, plus a purple pendant necklace one of my sons gave me for Mother’s Day. Also, please to note that I took this picture before Labor Day! I’m a Southern girl, y’all, and I don’t wear white after Labor Day! So out of three boxes so far, I have two dresses, a top, and a pair of earrings, all of which have seen a lot of play this summer, and none more than these earrings. I’d call that a win, and I’m really looking forward to my next box, which, if the tracking is accurate, will arrive this very afternoon! Thank you! Wish it wasn’t so short, but I do love the color!